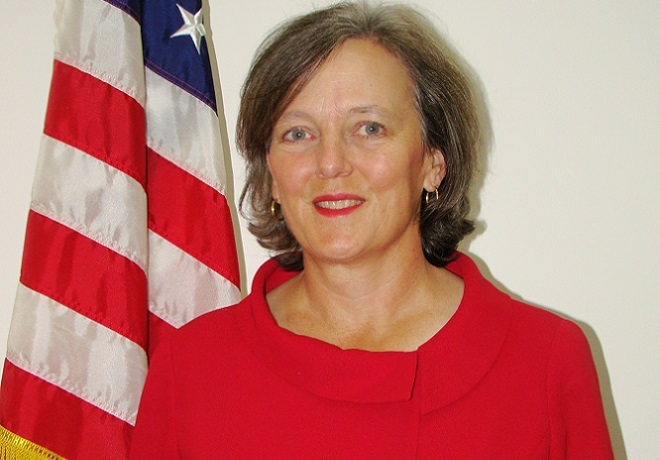 US President Barack Obama on Tuesday, February 24, 2015 nominated Katherine Simonds Dhanani as US ambassador to Somalia, the first in 24 years since the US embassy there closed in 1991 as civil war descended on Somalia. Photo: Courtesy of U.S. State Dept. President Barack Obama has nominated the first U.S. ambassador to Somalia in 24 years. She is Katherine Simonds Dhanani, a Foreign Service veteran who has previously served in five other African countries in various capacities. Dhanani will be based in neighboring Kenya until the situation in Somalia stabilizes to allow the U.S. embassy to reopen. U.S. State Department spokeswoman, Jen Psaki, said in a statement to Mshale that the nomination was a sign of the “deepening relationship” between Somalia and the United States. “Somalia has considerable work ahead to complete its transition to a peaceful, democratic, and prosperous nation. The United States is committed to supporting Somalia on this journey as a steadfast partner,” she added. Two years ago, the U.S. recognized the new U.N.-backed Somali government which continues to battle al-Qaeda linked al-Shabab. Other African countries that she has served in: Deputy Chief of Mission at the U.S. Embassy in Harare, Zimbabwe from 2007 to 2010 as well as at the U.S. Embassy in Libreville, Gabon from 2005 to 2007. Additionally, she was the Political and Economic Section Chief at the U.S. Embassy in Lusaka, Zambia from 2002 to 2005 and Economic Section Chief at the U.S. Embassy in Kinshasa, Democratic Republic of the Congo from 1999 to 2002. Dhanani also served as Staff Assistant in the Bureau of Inter-American Affairs at the Department of State, as Consular Officer at the U.S. Embassy in Brazzaville, Republic of the Congo. Dhanani received a B.A. from Kenyon College and an M.A. from the Massachusetts Institute of Technology. The U.S. Embassy in Mogadishu closed in 1991 when Somalia’s government collapsed as civil war ensued. “As security conditions permit, we look forward to increasing our diplomatic presence in Somalia and eventually reopening the U.S. Embassy in Mogadishu,” Psaki said. Dhanani’s nomination requires senate confirmation. She is currently the Director of the Office of Regional and Security Affairs in the Bureau of African Affairs in the Department of State, a position she has held since 2013.